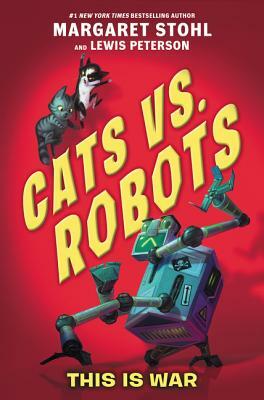 #1 New York Times bestselling author Margaret Stohl and Lewis Peterson’s hilarious middle grade debut has it all: robot overlords, secret feline agents, and earthling humans who are in for a real catastrophe. With examples of why coding is fun and other STEM applications cleverly woven into this fun and thoughtful story about looking beyond binary terms, this is the perfect novel for fans of House of Robots and The Tapper Twins. The Robot Federation and the Feline Empire have been at war for eons. And now that fight is coming to a tiny primitive planetoid…Earth. The mission for both cats and robots: retrieve the Singularity Chip. With it, cats can live past their nine lives, and robots are granted eternal battery life. Meanwhile, twin siblings Max and Min Wengrod are as different as can be. Min always gets good grades, and she loves to read and build robots. Max hates school, and prefers to play games and spend time online with friends. When Max rescues two kittens and is determined to keep them, Min is horrified that these furballs could ruin her chances at the Battle of the Bots competition. But with hidden forces at play in their own house, and the larger war between cats and robots fast approaching, will the twins be able to put aside their differences before they get caught in the crossfire? Margaret Stohl is the bestselling author of twelve books for children and teens, including coauthor of the #1 New York Times bestselling Beautiful Creatures series. She also cowrites Mighty Captain Marvel for Marvel Comics. You can learn more about her at www.mstohl.com. Kay Peterson is the illustrator of the Cats vs. Robots series. Lewis Peterson is a game developer and robot builder. When not writing books or making games or building robots, he spends his time reading books and playing games and chasing cats with robots.